1. Heat oil in a frying pan for the masala. 2. Fry the ginger for a minute. 3. Add the red chillies, cumin seeds, coriander seeds, fennel seeds, black peppercorns and turmeric powder. 4. Stir-fry for 2 minutes and remove the pan from heat. 5. Cool and then grind to a coarse paste. 7. Add the ground paste with little water and fry for 2 minutes. 8. Add the chopped mangoes and cook, covered, for another 2 to 3 minutes or till the mangoes become pulpy. 9. Reduce flame to low and add the coconut milk. 10. Stir gently to mix well. 11. Cover and cook for 20 to 30 minutes. 12. Add the prawns and cook for 5 minutes. 13. Switch off the flame and keep covered for another 2 to 3 minutes. 14. Heat oil for tempering and fry the tempering ingredients. 15. Add to the curry and remove. 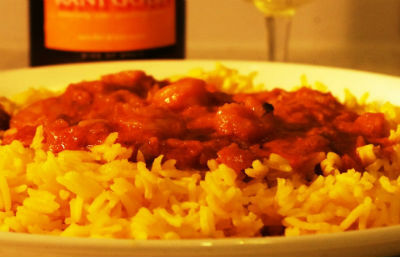 Feel free to comment or share your thoughts on this Goan Prawn Curry with Mangoes Recipe from Awesome Cuisine.